Alexander N. Shokhin was born 25 December, 1951 in the Arkhangelsk Region. Graduated from the Economical Faculty of the Moscow State University in 1974. From 1974 to 1987 he worked with several research institutions associated with the USSR Academy of Sciences, the USSR State Planning Committee and the USSR State Labor Committee. From 1987-1991 Mr. Shokhin was Economic Adviser to the Minister of Foreign Affairs, and Head of the Department of International Economic Relations of the USSR Ministry of Foreign Affairs. Twice, in 1991-1994 and in 1998, he held the post of Deputy Prime Minister of the Russian Federation. In 1991-1994 he also held positions of Minister of Labor, Minister of Economics, Chairman of the Russian Agency for International Cooperation and Development, and Russian governor at the IMF and the World Bank. On behalf of the Russian government he represented Russia in the international negotiations on Soviet-era debt. Additionally, he represented the President of the Russian Federation in Russia's relations with the G7 countries. From 1994 to 2002 Mr. Shokhin was a Deputy of the State Duma, where he occupied the posts of First Vice Chairman of the State Duma, leader of the Duma party bloc 'Our Home is Russia', Head of the Duma Committee on Credit Institutions and Capital Markets. 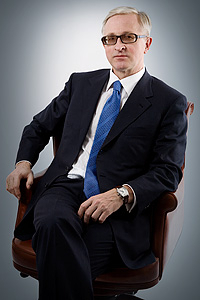 From 2002 to 2005 Mr. Shokhin was Chairman of the Supervisory Board of the Investment Group "Renaissance Capital". Since 2005 г. – President of the Russian Union of Industrialists and Entrepreneurs. In 2005 he became a member of the RF Public Chamber and the Chairman of its Commission for Competitiveness, Economic Development and Entrepreneurship Issues. Mr. Shokhin is a member of several deliberative bodies under the Russian President and Government, including the Presidential Council for Priority National Projects and Demographic Policies, the Russian Government Council on Competitiveness and Entrepreneurship, the Governmental Commission on Industry, Transport and Technology, the Governmental Commission on Administrative Reform and the Advisory Council on Foreign Investments. He is also Chairman of the National Association of Regional Agencies for Investments and Development of the South Federal District. Mr. Shokhin is an Independent Board member of OAO ‘RZhD’ (‘Russian Railways’), President of the State University – National Research University Higher School of Economic, Chairman of the International Cooperation and Investment Council. For his role in the advancement of Russian Industry Mr. Shokhin has been awarded the Order of Merit for Country of the IV Degree. He is also a Companion of Honour and a holder of other honorary distinctions, including the Order of St. Blessed Prince Daniel of Moscow of the II Degree, the Order of St. Blessed Peter and Fevronia of Murom of the I Degree, the Diamond Order of Public Esteem, the Russian Security Council National Security Medal and the Russian Ministry of Foreign Affairs Contribution to International Cooperation Decoration. Mr. Shokhin is married and has a son, a daughter and four grandchildren. Mr. Shokhin is Doctor of Economics, Professor.